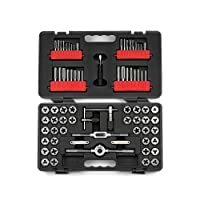 Having the best tap and die sets is helpful and beneficial to people working in the repair or garage businesses. Having this set will also be a good inclusion to your home tool kit. It is important that you know which one to buy, even if you’re just using it for household repairs. It has to possess outstanding quality and should be built to endure a long period of use. In this article, we will have a discussion about everything you need to know about tap and die sets. You will be informed of what it is and its advantages. We will also provide you with some of its types and the essential factors to look for. With so many models in the market today, how do you choose the best one? Don’t worry, we have pulled together the five best tap and die sets, along with their features, pros and cons. Before we move on with the discussions, first let us define what a tap and die set is. Basically, taps and dies are tools that you use to chop thread around a hole and into a rod. We will be having a more in-depth discussion about this below. 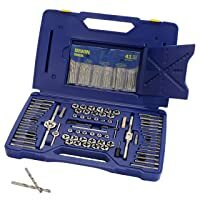 This kit is very important especially for DIY enthusiasts. It’s more likely that you won’t realize how significant they are until you own one. To further discuss, taps are used for cutting threads on the holes wherein threaded fasteners are positioned. On the other hand, dies are used for cutting threads on rods made of steel. They are considered as an extra tool for creating new threads upon newly formed bolts. In addition, dies are used to repair existing threads on dilapidated screws or bolts. 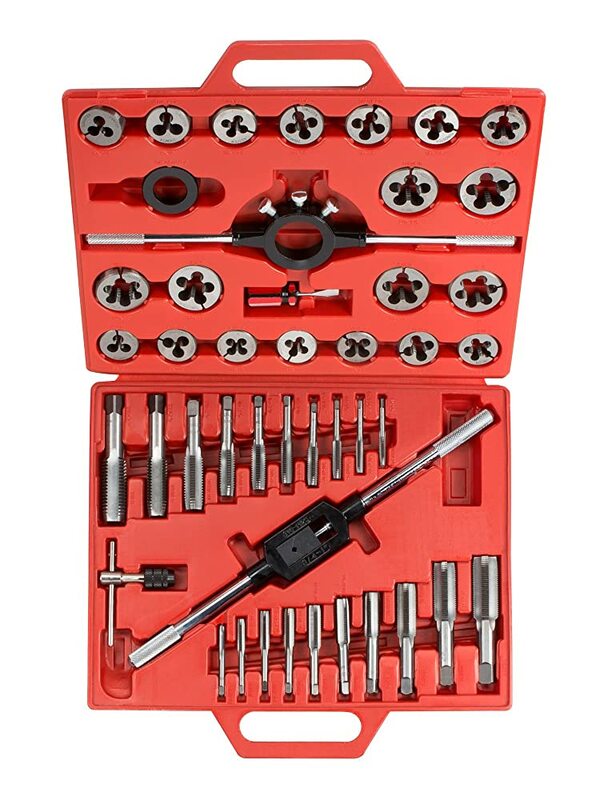 The best set should come with assorted taps and dies, allowing you to use different bolt sizes easily. One more thing, the set should be able to cover both SAE and metric sizes for versatility. It is also very important to buy the correct set for your needs. Choosing the best tap and die sets will prevent you from making an expensive mistake. After discussing the top five picks for the best tap and die sets, we will talk about some of its types. It is also important to read this section as it will help you narrow down your choices. In fact, you have to know which type it is you need so you can make a better decision. Taper Tap: This type of tap is usually utilized for initiating a cut or thread. They are generally tapered coming from the bottom up to the sixth thread on the top. Second Tap: These are generally used for deepening the threads cut by the taper tap. The angles are somehow similar to the taper tap but only until the sixth thread. Plug Tap: These are very different from the taper and second tap. Plug taps are primarily used for producing neat outcomes to the ends of the holes. Circular Dies – The purpose of circular dies is to produce complete threads in a single operation. Threads are tapered only on a side to allow comfortable initiations. Two-piece Adjustable Dies – These are regularly used for making longer threads. The procedure involves numerous cutting operations, which require the die to be closed after every thread. In this section, we will discuss the important factors to consider in choosing the best tap and die sets. This section is very significant, as it will also be a defining factor in order for you to choose wisely. We hope you can make a better decision if you were having a difficult time in picking the right one. Build Quality: This might be the most important factor you have to consider in choosing the right tap and die set. As there is a correlation between the price and quality, you have to ensure that the build quality is excellent. It is advisable not to buy cheaper ones as they are guaranteed to not last longer than expensive ones. Type of Steel: Build quality is directly connected to the type of steel used in crafting the tool. Low-quality steel will not be as sturdy as the ones constructed by a master craftsman. Handle: If you use a handle that is awkward and uncomfortable, there is a possibility of you making mistakes. It is important that the one you buy is also very easy to use. Exerting too much force will result to stripping threads and having your taps and dies broken. Size: The size of taps and dies is also very important. These are measured as SAE and metric sizes. Ideally, the perfect tap and die set should cover both sizes for versatility. Case: Strong plastic storage cases will make sure that the taps, dies, and all other components are safely kept in place. You will save a lot of time if you have your set organized in a sturdy case. In this section, we will have a discussion about the top five choices for the best tap and die sets. Along with their key features, advantages and disadvantages, a detailed review will be provided for every product. Be sure to pay attention, as we will be helping you narrow down your choices. We hope you can make a more meaningful decision if you were having a difficult time choosing. The Irwin Hanson Deluxe Set has almost every drill bit, hex die and tap that every user will need. The product can be used in every automotive repair work, as well as maintenance. 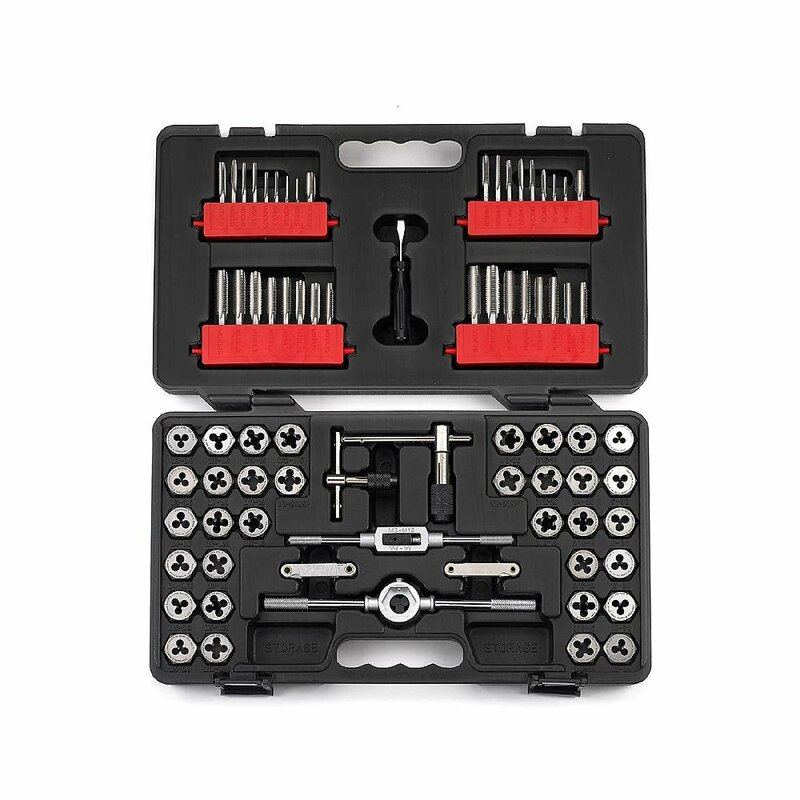 This set offers tools, which are specifically crafted for hand-threading various kinds of materials. They are crafted with high carbon steel, and they offer excellent accuracy even professionals rely on. For its specifications, die type is hexagon and tap type is plug. The Irwin Hanson Deluxe is an 117-piece set that is perfectly organized in a rugged plastic storage case. 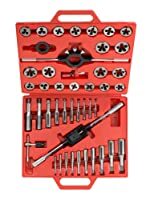 The deluxe set includes a machine screw, metric and fractional taps and dies, screw extractors, and high-speed steel drill bits. Having a set as complete as this, you will never have to worry about not getting your job done. 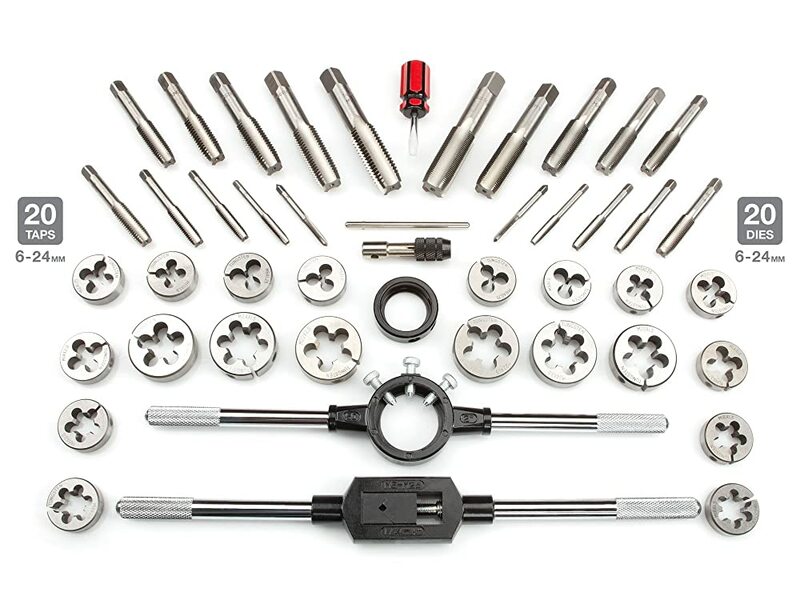 The GearWrench Set has 114 pieces of tools and is ideally used for confined and tight areas. It also features the Twist Lock Guide System that ensures the dies stay at the center, especially while the threads are cut. This set offers a ratcheting T-handle system that allows a 5-degree ratcheting arc. To add, the handle system has a reversible lever that allows changes from reverse to forward and vice versa. 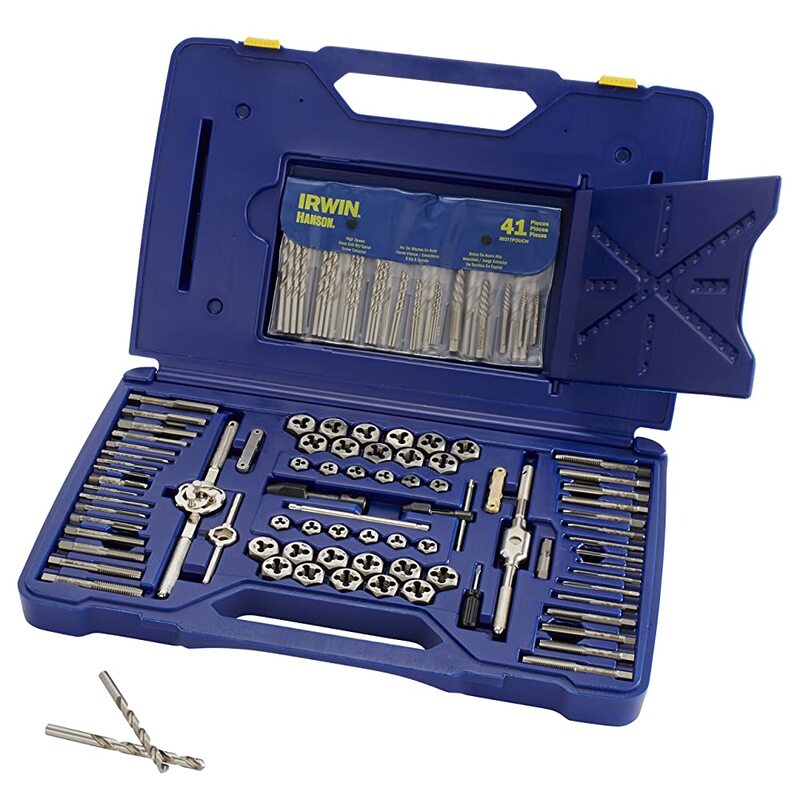 Included in the box are 48 taps and 48 dies, along with an SAE and metric thread gauge. Also included are 82800 medium and large ratcheting T wrench and an 82801 large locking tap adapter. It has an 82802 large hex die adapter and a small and medium-sized tap adapter. To add, included are male and female extension adapters and a sliding T for adapters. The Tekton brand is among the most reliable names when it comes to industrial tools. Needless to say, the 7561 is one of their most reliable and popular products. The components are made of hardened tungsten alloy that can cut new material or get rid of damaged threads. This is perfect if you wish to invest on something durable, sturdy and definitely for long term use. 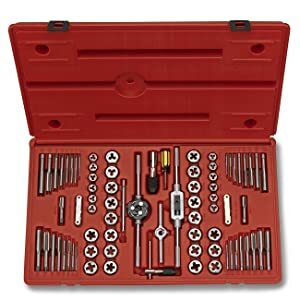 For its specifications, this box set includes 20 taps and 20 dies, a screwdriver, and a quarter inch T-handle wrench. Also, included in the set is an a-quarter-to-an-inch T-handle wrench and a 2-inch T-handle die stock. Lastly, this comes with a storage case and a 1 to half an inch die stock adapter. You just need the proper technique and the right lubricant, so you can get your job easily done. The Craftsman is another well-known brand when it comes to industrial-grade tools. This is very popular as it combines both metric and SAE sizes in one storage container. 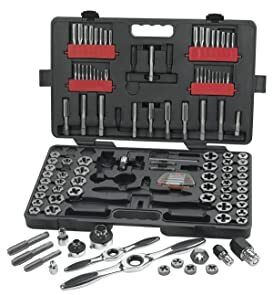 This set will help you get rid of damaged nuts, threads and bolts. To add, this tap and die set will make it very easy for you to remove imperfections in the threads. The set includes 7 drive tools, 17 SAE plug taps and hex dies, 17 metric plug taps and hex dies. The material is made of hardened and polished carbon steel that makes chip removal very easy for you. In addition, the hex-shaped dies allow the use of wrenches, sockets and die stocks. This set is perfect for household jobs but will not last long for big product plant use. It may not be for big time use but will surely get the job done from light to medium usage. Inside the Neiko tap and die set, you will find 20 assorted taps and dies used for cutting threads. An adjustable T-handle wrench can also be found inside, together with an adapter, a stock handle and a screwdriver. The components are made of quality alloy steel that makes it brittle-resistant. To add, with its coating, the taps and dies are guaranteed stronger than the usual steel crafting. The sizes are already imprinted on the taps and dies that allow you to organize and select with ease. Holding these tools is a sturdy and strong case made from hard plastic. In addition, thread cleaning is easier because of the professional-grade tap and die set. Like the product above, this may not be suitable for heavy use. This is perfect for household and casual fixing jobs. 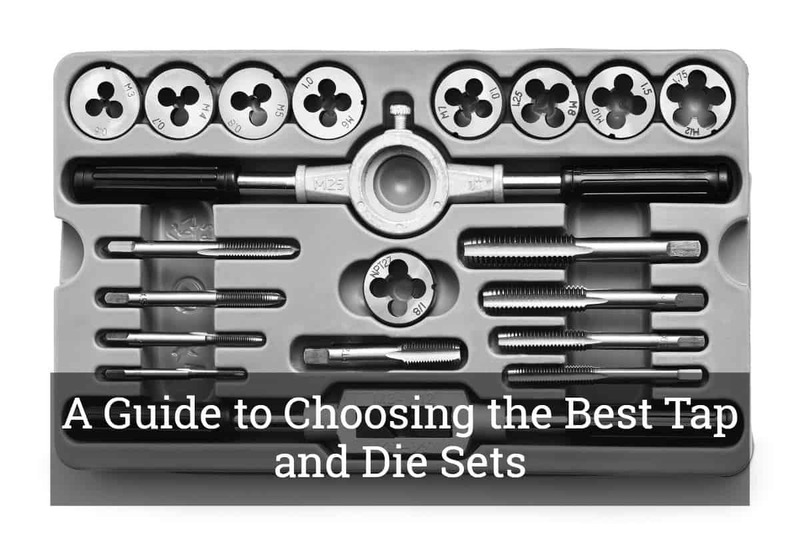 We know it’s difficult to choose the best tap and die sets, but we hope this guide can help you. You need to review each product’s features, pros and cons so you can narrow down your choices. 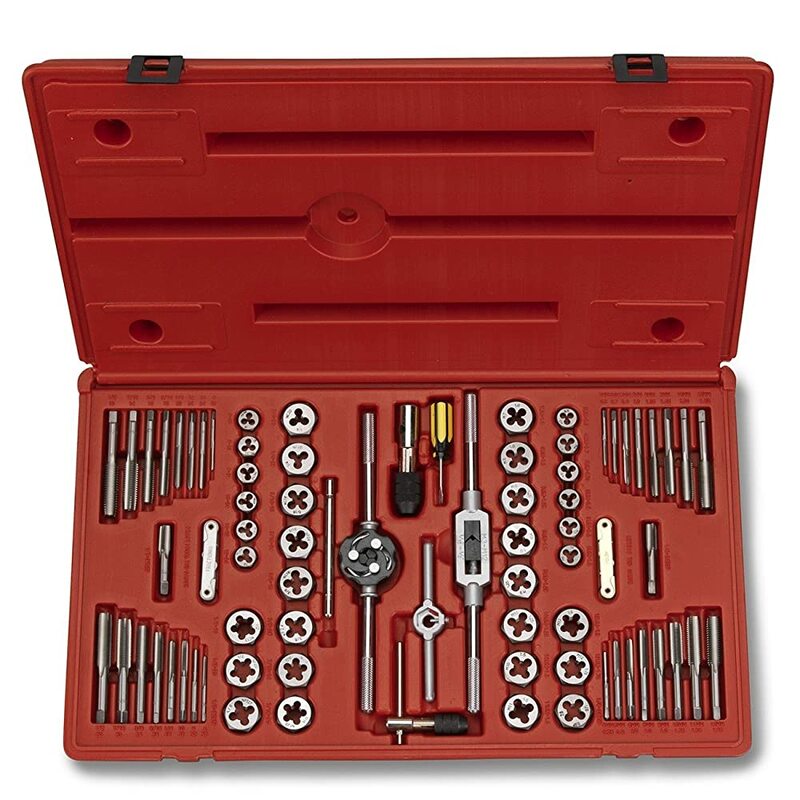 If you have the best tap and die set, it is guaranteed that you can get your job done easily. Looking for other similar products that you can buy? Click here to learn more about other options that are available in the market right now.